I just posted my final video review for Starpoint Gemini 2, and I say final because I’ve come to a very frustrating point in my experience with the game: The grind doesn’t feel worth it anymore. 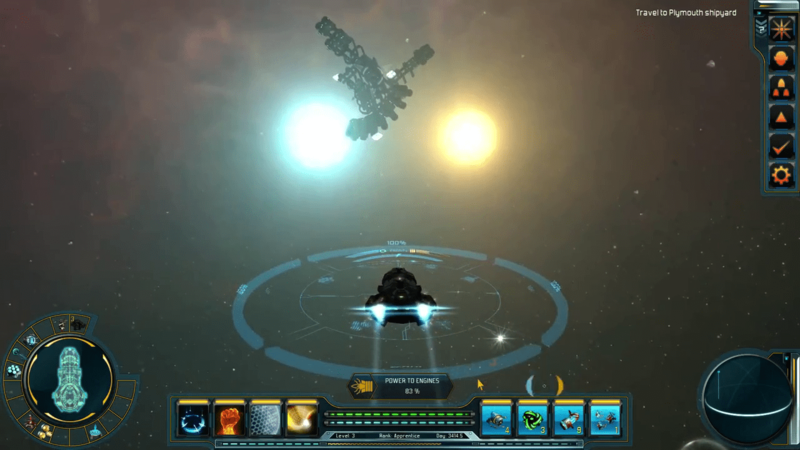 While playing the pre-release version of the game, players were given a pretty competent ship with which to fly around, blow up enemies and complete missions. It was fun, engaging, and I felt competent within and a part of the universe. In the final version, whether you play in story or free roam mode, you’re given a very small ship with which to start, and it kind of makes one feel a bit helpless at first. Now, other games that do this, like Freelancer — an example I’ll likely refer to more than once — they started you off in a small ship, but the mountain to climb to the next one didn’t seem so far, nor did the enemies so daunting that you couldn’t make progress during the game. Here, however, this was sadly not the case. In the free-roam mode, for example, you begin with a small ship and maybe 10,000 or 15,000 credits (I forget the exact amount), and can see a few missions on the map. These missions typically are lower leveled and pay maybe 5,000 credits. That sounds like a decent amount, but when you realize that the awesome ship you had in the beta was a couple million credits — and you realize it’ll take maybe 80-100 missions to afford such a ship — one starts to feel…exhausted. Story mode isn’t much better, as the ship you begin with is fairly dinky and the credit rewards for missions and such aren’t much better, even as your character levels up. You still run into the same problem though, as the better ships are far, far and away too expensive to get in what feels like a reasonable time frame. Now sure, I know some of you are saying, “But Brian, great money can be made in capturing ships, you should do that!” Well sure, I reply, but when you couple that, at least in story mode, most of the ships I encountered had more crew that I had troopers to board them, and in free roam mode, the ships I captured weren’t worth a hell of a lot, you run into the same problem. It’ll take what feels like forever to get to a better ship, which is one of the driving forces in a game like this: playing with all the toys. Again, Freelancer did a great job of this by making rewards for missions and loot stolen from slain enemies profitable enough that a new ship felt juuuuuuust within reach, making you do one more mission to get over the hump. Here, even after a few dozen missions, a new ship still felt far out of reach, and this was just damned frustrating. Therefore, when it comes to Starpoint Gemini 2, I just…can’t find the fun anymore, and this is damned sad. It’s not a bad game in the slightest. It’s technically competent, very pretty and the combat can be very visceral and satisfying. What it is, in my opinion, is a misbalanced game, and that is a lot harder to fix in the long run. Hopefully, whether through more patching or new content, the game will reach its full potential, but for right now, I have other things to play that will likely be less grindy and more rewarding within the same amount of time. It pains me to write this as I always try to be positive toward games, but honesty must win out over all else. Thanks for reading, my friends. Reminds me of an MMO I tried recently. After almost a month I had snuck in about 20 hours of grinding. Then I found a blog by one of the games’ community leaders where he demonstrated that a good player could do the initial grind in 40 hours of play and then graduate to the next level of grind and do that in another 40 hours and then, finally, would be able to play the actual PvP game. He thought that was satisfactory and fair but I thought it was over the top and so I abandoned the game. I think the solution for these situations is that games needs to build in some mechanism to allow the gamer to experience the full fledged game before completing the grind(s) to fully unlock it. This could be done via a ‘training mode’ or else special missions where you are given a nice ship that must be returned when the mission is completed or such. It is tough to balance a game when some users will spend ten times more time playing it than some other person, but that is a critical thing to try to do, especially in an MMO, but really for any game that ostensibly provides an open sandbox. Geeeeeez, that’s a LOT of time. I mean, if you love the game and don’t mind the “grind” have at it, but still, wow. Yeah, I can only imagine how many dials one has to turn to balance this stuff well. X3 lets you determine initially difficulty by the pilot you pick at the start. Maybe they need to do something similar and grade the initial difficulty accordingly. Penniless drifter, through struggling merchant right the way down to veteran mercenary difficulty. I played about three hours of the SG2 Early Access and enjoyed it but just never got around to trying the full game. Looks like I can wait a little longer. Yeah, I ran into that with Albion Prelude, and had a LOT more fun once I stumbled upon the campaign that gave the player a bit more focus and such. SG2 would definitely benefit with something like that. I, like you, got tired of grinding to gain the next ship… so instead of wasting my time I figured I’d just edit the save.sgs file. Sure, it is considered cheating, but I am having more fun than I did before. I don’t have time to grind away for 20-40 hours. I have other responsibilities. Welcome to the comments Bradley, and yeah, I did the same thing during the beta. Didn’t wanna do it for an actual review but I WAS SO FREAKING TEMPTED. I don’t mind a grind if it’s both fun and rewarding, but the grind here barely felt rewarding at all, which sapped away the fun. Sigh. Thanks! I just beat the single player game and it left a bunch to be desired. At first the game felt a bit like Freelancer but after awhile, even with the poorest voice acting this side of freelancer, it just became boring. Is there another space combat game that is both fun and beautiful? I’ve looked at Elite: Dangerous but don’t want to fork out $60 for an unfinished game. Next story OMGOMGOMG GOG Gets Star Wars Rebellion (and Others)!